Madness. I've been knitting on the blanket like it's a job, and still, there's no perceptible difference. The ball of yarn keeps getting smaller, even though the blanket doesn't seem to change much - later today I'll join the last skein on (and I got an email last night letting me know that the rest of the yarn has already shipped out of The Loopy Ewe - damn they're fast) and if I'm lucky it will arrive just as I run out. The blanket is lovely (and, I suspect, extremely large) but I think I'm close to snapping. This morning I looked around and saw little mountains of yarn everywhere. Bright piles of yarn - in combinations that are thrilling and delightful, like bowls of candy, or piles of leaves or all the laundry thrown on a teenaged daughters floor. All this white is starting to affect me. Check this out. See those two skeins of yarn? Suddenly, I think they go together PERFECTLY. A week ago I would have thought that was bold as brass, but now? Oh lovely. Just lovely. This morning I wondered why I don't own any red shirts. I washed Sam's green pants in the fond hope that she'd wear them. I think having a black cat is lame. I left out a rainbow roving, just for ornament. All this white is getting to me, but I know what Denny would say. "At least you're not knitting it in January." PS. I know. You need to know what yarn that is. 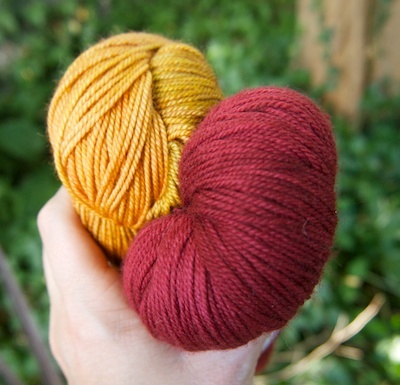 It's String Theory Casper Sock in melon and winterberry. PPS. Yes Presbytera. The links for events in WEBS and Maine are right here. PPPS: for everyone wondering how I kept warm in New Brunswick after I forgot my woolies? I didn't need 'em. It's October in Canada and it was warm and lovely. That's either fabulous or scary.